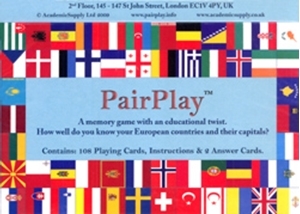 PairPlay Europe is a memory game for all the family, with a geographically educational twist. How well do you know the country capitals, flags and key facts on the European continent? Play snap, match the pair or quiz master with PairPlay Europe. Apposite for home entertainment or slipping into your luggage, the game is suitable for between 2 and 6 players of 5 years and over and consists of 108 playing cards, as well as instruction and answer cards.